As part of the mass signature campaign launched by the central committee of the Asom Gana Parishad (AGP) against the Citizenship (Amendment) Bill 2016, the Udalguri district committee of the party also conducted the campaign in Tangla on Sunday. The Citizenship (Amendment) Bill, 2016 seeks to grant Indian citizenship to illegal migrants who are Hindus, Sikhs, Buddhists, Jains, Parsis and Christians, who came from Afghanistan, Bangladesh and Pakistan to the country till December 31, 2014. The common people including litterateurs, senior citizens, artistes, journalists from of the town joined the campaign opposing the Citizenship (Amendment) Bill 2016 which violates the spirit of secularism as enshrined in the Indian Constitution by distinguishing illegal immigrants on the basis of religion. The party workers of the AGP, which is also one of the partners of the Bharatiya Janata Party-led coalition Government in Assam, stated that the proposed Citizenship (Amendment) Bill 2016 if passed will be a threat to the existence of the ethnic communities in the State. “The proposed Citizenship (Amendment) Bill will exterminate the indigenous ST, SC and other ethnic communities of Assam and turn the indigenous people of the State into minorities,” said the president of the Udalguri district unit of AGP, Jatin Kumar Deka. 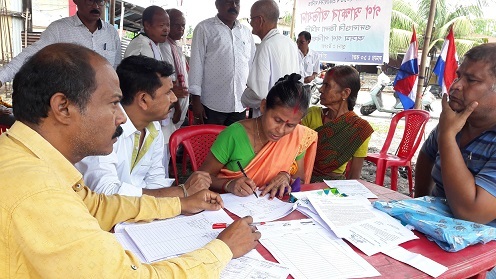 Among the people who were present during the mass signature campaign included educationist Binoy Kumar Medhi, retired teacher and noted citizen, Nabin Chandra Bezbaruah, Udalguri AGP unit’s joint secretaries, Promod Hazarika and Pradip Pathak and others. More than 4,000 people joined the mass signature campaign. The signatures would be sent to the Joint Parliamentary Committee (JPC) on the Citizenship (Amendment) Bill, 2016.